The ball left senior forward Lowell Ulmer’s hand from three-quarters court with nothing more than a prayer. 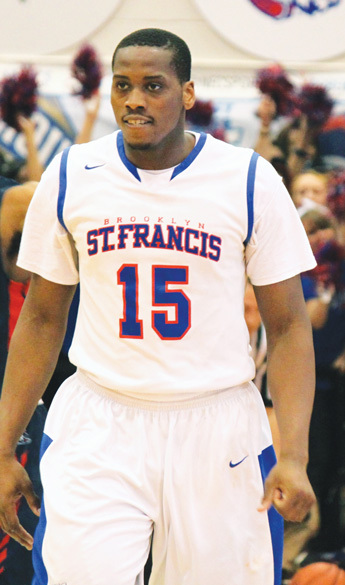 Trailing by three, the heave was the final chance for the St. Francis College, Brooklyn Heights, men’s basketball team to send the 2015 Northeast Conference (NEC) championship game against Robert Morris University, Moon, Pa., into overtime. The ball looked very much on line as time expired. It hit the back of the rim and popped straight up, but it fell to the side. A crowd that had broken decibel levels all night was rendered silent, while all that could be heard in the Daniel Lynch Gymnasium were the sounds of the Colonials – not the Terriers – celebrating their 66-63 win and their upcoming trip to the NCAA Tournament. And so the streak continued for at least another year: St. Francis College remains one of five Division I men’s basketball teams to have never reached the NCAA Tournament, with the others being the Northwestern University, Evanston, Ill.; Army, West Point, N.Y.; The Citadel, Charleston, S.C.; and the College of William and Mary, Williamsburg, Va. 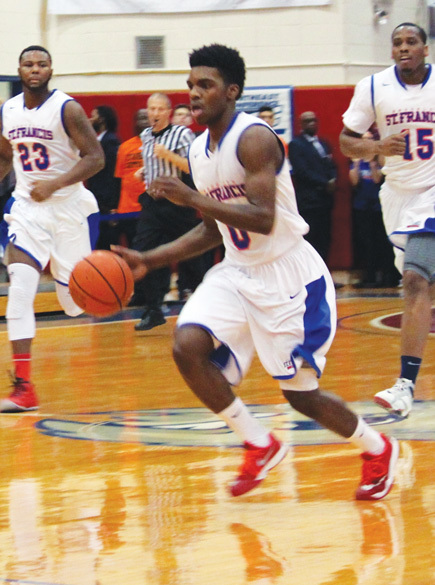 However, every new season for St. Francis brings the hope that this will be the year the team makes “The Big Dance.” And with the memories of how last season ended still fresh in their minds, the Terriers have some unfinished business to take care of. The Terriers finished last season as Northeast Conference regular season champions, and though the team surely wanted to take that one step further, that was a foundational building block for this current season. A tough loss such as the one in the NEC championship can be a motivating factor for a team to want to get back to that same stage the following year. And that’s exactly what’s going on right now in Brooklyn Heights. “I knew how much work I needed to put in to be the player that I’m trying to be this year and accomplish the same things or more that we did last year,” said senior forward Amdy Fall. Two key contributors from last year’s team – NEC Player of the Year Jalen Cannon and senior point guard Brent Jones – have moved on from the program. But many of the same faces that helped the Terriers reach the title game are back and hungry for an NCAA Tournament berth. But even so, the thrill of being part of the first-ever St. Francis team to reach the NCAA Tournament is undoubtedly a motivating factor for this year’s squad.